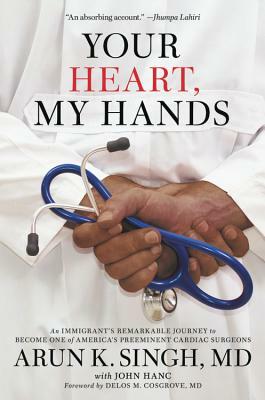 An encouraging and inspiring true story on how a boy from India overcame a difficult childhood and devastating hand injuries and became one of the most prolific cardiac surgeons in U.S. history. Arun Singh, M.D., preeminent cardiac surgeon, has personally performed over 15,000 heart surgeries. Dr. Singh has earned numerous awards as a physician including the American Heart Association's Hero at Heart Award and the Milton Hamolsky Outstanding Physician Award. In practice at Rhode Island Hospital since 1975, Dr. Singh has been voted "Top Doc" by Rhode Island Monthly Magazine for the last 16 years. He was also elected to the Rhode Island Heritage Hall of Fame, only the second person of Indian descent to receive this distinction. He lives in Providence, RI. Delos Cosgrove, M.D., is a renowned cardiac surgeon and President and CEO of Cleveland Clinic, one of the nation's largest and most prestigious medical centers. An advisor to President Obama on veteran's affairs, he was recently appointed to President Trump's Strategic and Policy Forum, which offers non-partisan advice on job growth. John Hanc is the author or coauthor of seventeen books, including the award-winning memoirs Not Dead Yet (Thomas Dunne), co-authored with cyclist Phil Southerland, and The Coolest Race on Earth (Chicago Review Press), an account of Hanc's participation in the Antartica Marathon. He is also the coauthor of Fighting for My Life (Thomas Nelson, 2019) with Jamie Tyrone and Marwan Sabbagh. A longtime journalist, Hanc is a frequent contributor to the New York Times and Newsday, and his work has appeared in such publications as Smithsonian, the Boston Globe, Runner's World, and the Columbia Journalism Review.